​The Michigan Department of Environmental Quality (MDEQ) has approved a request for funding to complete the Upper Pine River Watershed Management Plan. The Gratiot Conservation District has applied twice for a planning grant to finish writing a watershed management plan for the Upper Pine River Watershed (upstream of the dam in Alma). Although the proposal was recommended for funding during the summer of 2016, government funding was not available at that time. The amount requested last year was $141,670, and Meyer says that if costs are still roughly the same, that is the amount that should be expected. The funding will be used to pay an independent consulting firm, Streamside Ecological Services, to finish writing the watershed management plan, submit the completed plan to the MDEQ for final approval, and apply for implementation dollars. This project is a long way from completion, and real changes to water quality using these implementation dollars are still years away, but this is a positive step in the right direction. ​As a homeowner, you are responsible for maintaining your septic system. If your septic system is not working correctly, it could be polluting the water. Be proactive! New technologies can trace pollution right to your door. Check your septic system now to avoid legal trouble later! The group is putting together a community workshop to inform people about the challenges the river faces, to offer some possibilities for short and long-term action, and to find out what residents see as the most important issues to address first. Gratiot Conservation District has teamed up with the Mid-Michigan District Health Department, the City of Alma, and Saginaw Bay Watershed Initiative Network (WIN) to update health department records of septic systems and begin the process of fixing failing systems. The first step of this long-term project involves creating informational and educational materials that will be distributed to landowners in the Upper Pine River Watershed (mostly upstream of the City of Alma). The next step involves working with the health department to update records of septic systems using Geographic Information Systems (GIS) technology and digitizing hard-copies of existing data. This will be used, along with other scientific data, to create a proposal that will be presented to potential partners, grantors & funders to gather support for Phase II of the project. Phase II of this long-term project will involve a revolving loan system of replacing failing septic systems similar to the sustainable model developed in Bay County, a canine source tracking study similar to what has been used in Clinton & Shiawassee Counties as well as on the Chippewa Indian Reservation, and continued education & outreach. 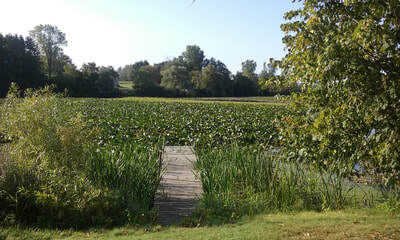 ​The GCD was approved for funding from the DEQ to finish writing the UPRWM Plan through 2017 round of funding. The GCD will be contracting with Streamside Ecological Services to complete the plan and begin planning for implementation funding. The official project work is scheduled to begin on December 1st, 2017 and the grant is a one and a half year project. Community support for the project relates to extremely high levels of E. Coli in the waters of the Pine River. The DEQ conducted extensive water quality testing in the summer of 2017 including DNA source tracking. 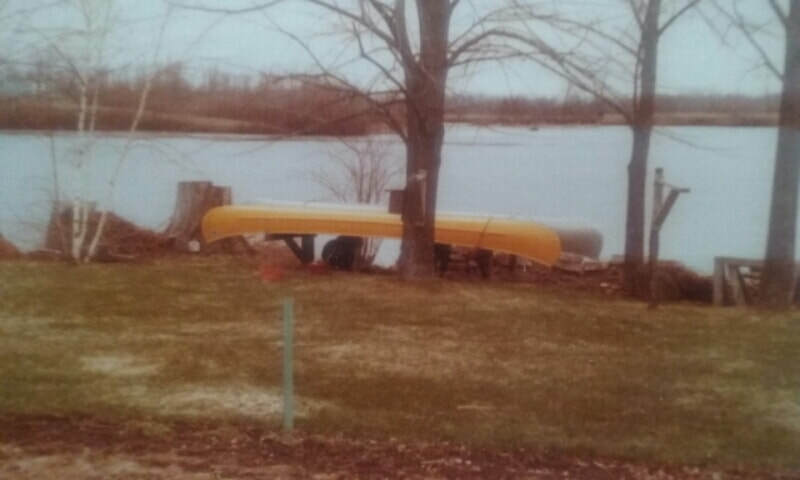 Although the DNA source tracking is still in the evaluation stage with Saginaw Valley State University, water quality testing resulted in high enough levels of several pollutants as to warrant the DEQ to establish Total Maximum Daily Load (TMDL) designations in the Pine River. These results will be included in the UPRWM Plan and submitted in requests for implementation funding. Read up on blog posts about the Pine River Watershed, or see some highlights below! ​The Gratiot Conservation District has been awarded a grant by the Michigan Department of Environmental Quality (MDEQ) to finish writing a watershed management plan for the Upper Pine River Watershed (upstream of the dam in Alma). 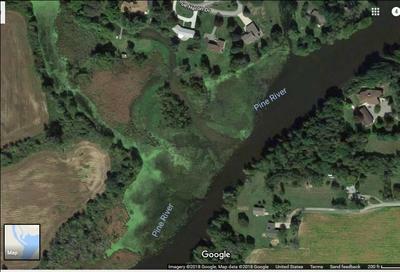 How will this improve conditions in the Pine River? This project is a long way from completion, and real changes to water quality are still years away, but this is a positive step in the right direction. The approved watershed management plan will outline specific projects that, if implemented, will improve the water quality in the Pine River. What kinds of projects will be included? The short answer is: anything that will help improve water quality. The ultimate goal is clean water. There are a few basic categories of challenges to be addressed and they break down as follows: Sedimentation and Soil Erosion The largest source of pollution in Michigan streams is sediment. When soil washes off the land and into the water, it builds up and clogs the streams, ditches, drains, and lakes. The soil also carries with it any other pollutants that are attached, such as fertilizers, pesticides, and animal waste. Nutrients Anything that has been applied to the land has the potential to runoff into the streams. This includes lawn fertilizer, agricultural phosphorus and nitrogen, manure, waste from migratory birds such as geese and ducks, even salts and other chemicals that wash off the roads. Tile Drainage Systems Most of central Michigan was once very swampy. In order to farm and live on the land, drainage tiles are installed to pull water out of the soil and wash it downstream. Without proper tile drain management, any chemicals or nutrients in that water washes downstream as well. Failing Septic Systems A recent study conducted in cooperation with the Mid-Michigan District Health Department identified approximately 300 properties in the Upper Pine River Watershed where there were no records of a septic system having been installed ever, or after 1970. The life of a septic system is about 20-30 years if properly maintained. Even if a high-quality septic system was installed thirty years ago, and has been properly maintained by pumping the system every three to five years, it is likely failing and human waste is seeping into the groundwater and streams. Many other sources of pollutants will be specifically identified in the plan including crumbling infrastructure like roads and bridges, improvements to the dam system, and dredging in the impoundment. But identifying challenges is only the first step. Solutions must also be planned for each challenge and then those solutions must be implemented. That will require more funding and more work. The Gratiot Conservation District is committed to keep working to bring grant funding into the community to improve water quality, but this is a long-term project. ​The Gratiot Conservation District has been awarded a grant by the Michigan Department of Environmental Quality (MDEQ) to finish writing a watershed management plan for the Upper Pine River Watershed (upstream of the dam in Alma). The approved watershed management plan will outline specific projects that, if implemented, will improve the water quality in the Pine River. Identifying pollutants in the water is only the first step. Solutions must also be planned for each challenge and then those solutions must be implemented. That will require more funding and more work. One focus at the Gratiot Conservation District addresses several categories of pollutants in the watershed: conservation farming practices. The largest source of pollution in Michigan streams is sediment. When soil washes off the land and into the water, it builds up and clogs the streams, ditches, drains, and lakes. The soil also carries with it any other pollutants that are attached, such as fertilizers, pesticides, and animal waste. Planting filter strips, buffer strips and grassed waterways help create a barrier between farm fields and streams, preventing soil erosion and sedimentation. Anything that has been applied to the land has the potential to runoff into the streams. Preventing the soil from reaching the stream addresses multiple challenges. Making the transition from conventional tillage to no-till farming is another way to hold soil in place, especially if the change includes planting cover crops. Changing farming practices takes time and money. The Gratiot Conservation District is working with partners who may have funding available to help farmers make those changes. 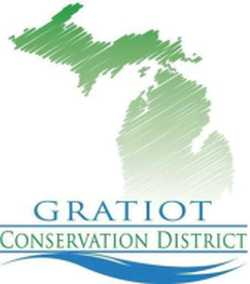 The Gratiot Conservation District is committed to keep working to bring grant funding into the community to improve water quality, but this is a long-term project. ​The Gratiot Conservation District has been awarded a grant by the Michigan Department of Environmental Quality (MDEQ) to finish writing a watershed management plan for the Upper Pine River Watershed (upstream of the dam in Alma). This is a huge step forward in the future health of the Pine River, which has been identified to contain high levels of several pollutants including E. coli bacteria, and sediment buildup. Why is this important? The funding will be used to pay an independent consulting firm, Streamside Ecological Services, to finish writing the watershed management plan, submit the completed plan to the MDEQ for final approval, and apply for implementation dollars. The Upper Pine River Watershed Management Plan was started by Julie Spencer in 2012, but the project didn’t really take off until the winter of 2013 when community members who lived along the river got involved, most notably Jane Keon and Gary Rayburn. Jane Keon took the framework for the plan, organized the notes and data that had been gathered, and attempted to finish writing the plan. It was close, but not yet the way DEQ wanted it submitted. That’s where the funding will make all the difference. Hiring the consulting firm to finalize the plan is essential. They know all the ins-and-outs of taking the project across the finish line. What’s the next step? Once the plan is written, it will be submitted to the MDEQ for final approval. The approved plan will lay out specific projects that, if implemented, will improve the water quality in the Pine River. The ultimate goal is clean water. This project is a long way from completion, and real changes to water quality using these implementation dollars are still years away, but this is a positive step in the right direction.